The fencing community is by and large a very welcoming community and here at Selberg Fencing we’re always happy to see newcomers take up the sport and share our passion for fencing. Like most things, when you’re just starting out there are tonnes of different things to learn, as well loads of questions you’ll want answered. In our latest post we share some fencing advice that has been handpicked by fencing forums out there which is specially tailored to beginners to the sport. • Nimble fingers also help with fencing and interestingly some people swear that playing the piano or typing at a fast rate also help finger speed which helps when holding the blade and keeping hand movements quick. • Bend your knees. It goes without saying that this is essential to fencing, but many beginners don’t practice this enough. Since this can feel awkward and uses muscles that often don’t get a work out, it’s an important to practice this particularly in the beginner’s stage as this can be more difficult to correct later. • Despite some contention between fencers, most coaches agree that starting fencing with the foil weapon gives the best introduction to the technical aspect of fencing as well as the basics like right of way and parry/riposte. Foil is a stabbing action which helps balance and footwork, while sabre is more of a cutting action which can be learned more easily later as the basics are mastered. • Keep your fitness up this helps with endurance and you won’t be complaining about muscle pain in the legs. Footwork exercised and squats help with doing this. 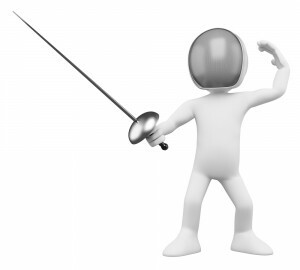 Stay tuned to our fencing blog for more upcoming advice when immersing yourself in the art of fencing. For training fencing DVD’s, simply visit our store. This entry was posted in Fencing advice and tips by admin. Bookmark the permalink.